Details: Celebrate silly, not-too-spooky fun on Saturdays and Sundays in October. Children (under 9) are invited to come dressed up and join in our costume parade during this daytime event. 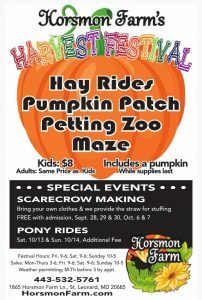 There are other family-friendly activities, too, like our all-new hay maze, trick-or-treating locations and interactive show. Please use discretion when visiting the park with young children after 5:45 pm when frightening elements come out for Howl-O-Scream. August 25th and 26th – Children’s Weekend: One child aged 7 through 15 is admitted free with each adult ticket purchased. Children 6 and under are always free! September 3rd, Monday – Seniors Day! All wise elders 62 and older are admitted free. September 15th and 16th – Celtic Celebration. In addition to the entertainment throughout the village additional music and merriment with a Celtic flare. September 22nd and 23rd – Special guests the UK vocal ensemble Mediaeval Baebes perform throughout the weekend. The Baebes are currently featured on the Emmy nominated title track of the hit TV show Victoria. September 29th and 30th – Pirate Weekend! Enjoy rousing special guests on stage and in taverns. Show up as your favorite pirate. October 7th and 8th – Shakespeare Weekend. A tribute the the Bard, at various stages and path shows throughout each day. Also Sunday – Various shows are ASL interpreted. Please visit Guest Services for complete listings. 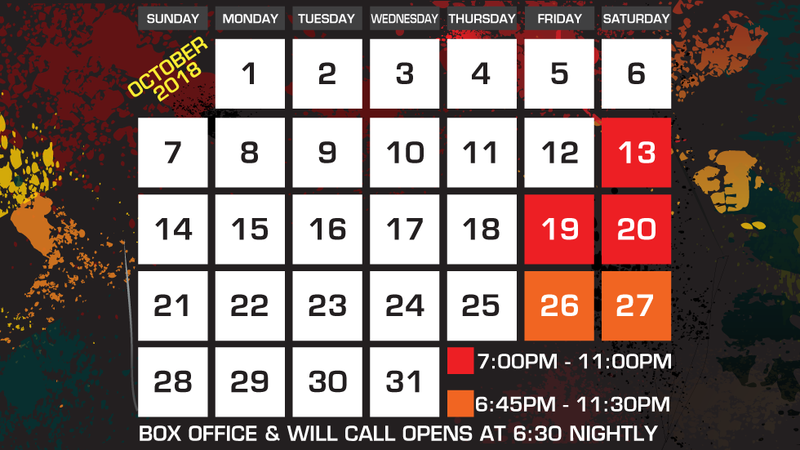 The first three weekends, in addition to the children and senior free dates, all tickets are reduced from August 25th through September 9th without any coupons or special purchases required. Peak season pricing begins for the weekend of September 15th and continues through October 21st. Visit www.MarylandRenaissanceFestival.com for pricing, directions, full scheduling and event info. Details: It’s Fire Safety Prevention Week. 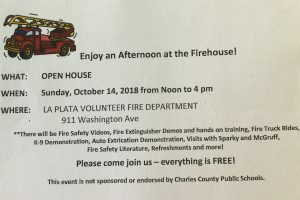 The La Plata Volunteer Fire Department, is hosting a Open House on October 14, 2018 from 12-4 PM. There will be fire safety videos, fire extinguisher demos, hands on training, fire truck rides, k-9 demonstration, visits with Spark and McGruff, Fire Safety literature and more! Details: Our Kids Expo is a diverse experience for all things child related. This event is for families looking for information on child health, wellness, education, enrichment and extracurricular programs. We will have activities, demonstrations and exhibits throughout the day. Please join us to learn what our local area has to offer! Browse dozens of vendors and see live presentations! Details: Free lacrosse clinic for girls ages 5-14 that are interested in learning about the game. Equipment will be provided. No RSVP necessary and bring your friends! Details: The La Plata Farmers Market is a great way to shop locally. You will find local and family owned farms and businesses selling: produce, meat, eggs, homemade goodies, plants & flowers. My favorite parts of the farmers market are grabbing fresh cup of coffee from Wee Bean Roasting Company and meat from Hancock Family Farms. Meet at the Visitor Center to discover the different furs down at the Woodland Indian Hamlet. Details: Enjoy an English based storytime with some added Spanish words and watch as our Spanish vocabulary grows. We’ll read books, sing songs, dance and make a craft. It will be fantástico! September is five sense theme and October theme is Halloween. Details: Come on out for out Fall Festival! 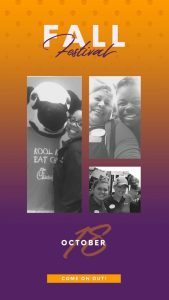 Thursday, October 18th from 4:30-7:30. Moon bounce, face painting, balloon animals, games and prizes! Details: Use tape to create art. Details: Be a paleontologist for the day! Ongoing activities include: digging for “dinosaur bones” in the Discovery Room sand box, a scavenger hunt filled with fun dinosaur facts that ends with participants cracking a dinosaur egg, and making a dino hat. Scheduled activities at 11 a.m., 1 p.m. and 3 p.m. include: excavating real fossils from matrix, singing special dinosaur songs and learning the dinosaur stomp dance. 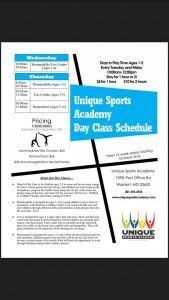 Activities appropriate for ages 4-10. Details: Check out Aquafina $2 Family Fun Nights at the Museum! Enjoy three floors of interactive exhibits along with fun and engaging programs for just $2 per person from 4-8PM! Also take part in drop-in programming including our interactive Circle Time featuring stories and songs, visit the SPCA and more! Details: Stop by the Town Hall on Friday, October 19th from 5 pm to 7 pm for the Harvest Halloween Party. Come in costume and enjoy crafts, snacks, and treats for the little ones. Tickets go one sale for Friends of the National Zoo members on Sept. 6, and non-members Sept. 13. Join now to receive early access to purchase tickets, ticket discounts, and more! Details: Celebrate the end of a long week at our teen-only after hours event. Play a classic video game, Foosball or even a tabletop game with friends. Complimentary snacks provided by The Silver Diner of Waldorf. Details:Dance the night away with the SOMD food bank to ease the pain of hunger with radio personalities T-Bone and Heather! 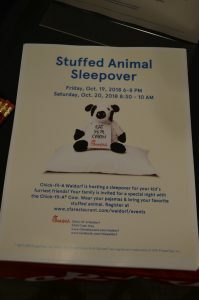 This event is for adultes, but a great cause. Details: A single ride admission includes a stop at the target range and 3 infected areas. The ride lasts about 15 minutes. Get a free admission pass to the ride with purchase of additional ammo during your first ride. Age Group: All Ages welcome, I would not recommend for small children based on fear factor. Details: Join us for a family-friendly morning of spooky science! Along with a spook-tacular Mad Scientist demo, your ticket includes your choice of fulldome show. Your visit also includes spooky science-based hands-on activities. Make it even more fun by wearing your costumes! Location: Calvert Marine Museum, Solomons. Details: This program is designed for people who want to learn more about fossils: where to find them, how to identify them, what they can tell us about the past. This program is for adults and children 8 and older, accompanied by an adult. Details: Create your own halloween bag perfect for trick or treating. Details: Enjoy a morning of pumpkin carving and scarecrow building. Participants must provide an old shirt, pants, and pillowcase for the scarecrow. One pumpkin, tools, straw, and large clear bag for your scarecrow included. Paid participants may enjoy cider and donuts between activities. 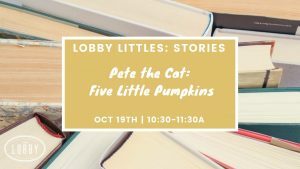 Details: This story time is a monthly program that is scheduled for every 3rd Saturday and includes books, songs, fingerplays, and flannel board stories. It is designed for children of multiple ages and their parents. This is a 45 minute program and a simple craft is included. Details: Choose your own STEM adventure to find the pirate’s treasure! Complete STEAM activities to lead you to a treasure chest. 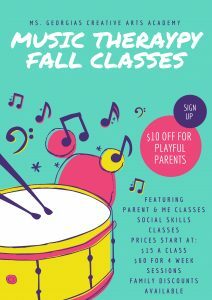 Details: Enjoy some family bonding time in this one-hour class that will include yoga poses matched with to easy-to-learn songs. There will be some partner and family poses and we’ll be finishing with a fun craft! This is for families, so at least one parent/guardian must be participating in the class with the child. Location: Elite Details: Kids Night at Elite Our fun-filled kid nights include gymnastics, arts and crafts, and games based around a fun theme. Fee covers activities, pizza, and drinks. 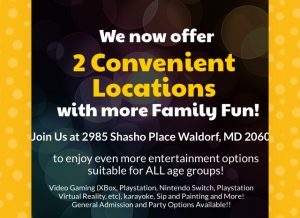 This is THE most Fa-BOO-lous party in Waldorf! Last year we Sold Out very quickly, Don’t wait too long to register. Details: A mad scientist has taken over the Great Jack O’Lantern Campfire! The scientist hates all things Halloween and is threatening to cancel the holiday using his cunning intellect. Can you help save Halloween? If you think you can, then put on your lab coat and goggles, and join the spooky fun! Bask in the warmth of the fall campfire, roast marshmallows, and enjoy popcorn and hot cider. Listen to haunted Halloween tales, see a dazzling display of hand-carved illuminated jack o’lanterns, and more! Kid-friendly activities include a spooky science show, a pumpkin hunt, and roasting marshmallows. Don’t miss this howling good time! Rain date is Sunday, October 21 at 6 pm.